Prepare Your Customers For the Seasonal Harvest! While it’s winding down, it is still summertime, and along with that comes the best time of year for seasonal fruits and vegetables! As we get closer to fall, the cornucopia will be overflowing with the results of the summer harvest, leading to an increase in fruits and vegetable sold, bought, and consumed. 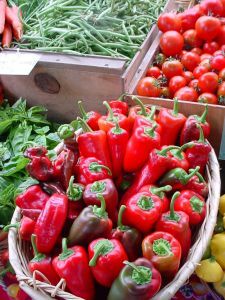 This is the time of year to take advantage of this seasonal trend, and promote the goods needed to accommodate your customer’s fresh-picked bounty. The journey from the farm to the store or restaurant is the easy part, as everything travels in bushels. Once it reaches the store, however, having a way for customers to easily transport products home is where your expertise comes in handy. Having rolls of produce bags on hand is an obvious necessity, but having portion controlled or packaged/prepared produce is a great opportunity for a retailer to increase sales on fresh produce. The following guide is just a small assortment of items with great merchandising potential for everything (grown) under the sun. 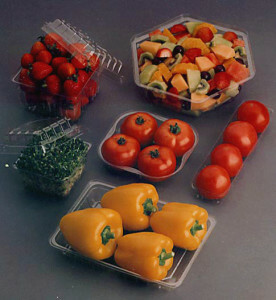 Crown Poly offers a large variety of produce bags, primarily the self-serve variety on a roll. This product guide highlights the Pull N’ Pak offerings, including green-tinted leafy green bags, yellow-tinted organic produce bags, or natural transparent produce bags. With thicknesses ranging from 6 microns to over 15 microns, Crown Poly has a bag strong enough for yams, and light enough for lettuce, all offering an easy, sanitary way to transport produce from the store to the refrigerator. Fantapak is another option for high quality produce bags that come in a perforated header version as opposed to a roll bag. 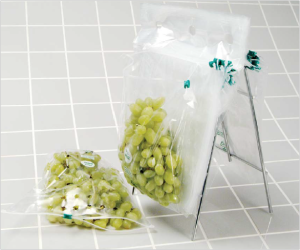 These include the attractive 5-a-Day print bags, clear bags, specialized corn print bags, celery bags, and grape bags that are perfect for pre-portioned quantities. The 5-a-Day bags are a great way to remind customers of the health benefits of eating additional fruits and vegetables, while merchandising your produce in an attractive manner that sells more produce. Fantapak also produces bags with custom prints and sizes for a any of your customer’s needs. 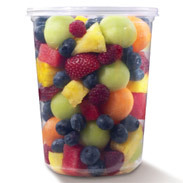 Fabri-kal offers a large assortment of clear deli containers, including their innovative Pro-Kal with insert options, and their eco-friendly Greenware, which are ideal for selling ready-to-eat fruits and veggies. Prepared salads are becoming increasingly popular, and are a great way to make use of all of the fresh fruits and vegetables available this time of year– The Fabri-Kal Cup Inserts allow for the easy sale of salads with dressing, veggies with dip, or cut up fruits and yogurt that stay separated until the consumer decides to indulge. Fabri-Kal also has a line of mushroom tills, as well as the ability to custom print any of their Pro-Kal or Greenware cups and deli containers. Pactiv has everything a customer would need to stock a salad bar, including Earth Choice products, made entirely from plants! With a wide assortment of hinged containers, deli containers, berry containers, and trays for serving vegetables and fruits in style, Pactiv has a little bit of everything for keeping fruits and veggies fresh and delicious for consumption. Just one glance through their catalog, and your customers will be inspired at all of the serving options available to them. Whether selling to a grocer, a deli, a restaurant, or a caterer, the options for serving fruits and vegetables are about as diverse as the produce itself! This brief sampling of popular options should be a good conversation starter to help you guide your customers down the right path in choosing what products are best for their needs. For more literature options, visit our Literature by Vendor Page. Empress Food Service Segment Expanding! Next story Make Your Customer’s Trash Your Business! Previous story Raise a Glass for International Beer Day!